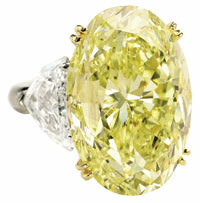 Oval fancy vivid yellow internally flawless diamond ring, 36.99 carats. Sold at Sotheby’s in December 2008 for $2.65 million. Recent auction results prove that there is a strong and vibrant market worldwide for jewels, but not just any jewels. Asian buyers continue to pursue white diamonds, especially in sizes over 10 carats, as well as those of color. The two top diamonds in Sotheby’s New York December sale both went to Asians: an oval fancy vivid yellow diamond for $2,658,500, and a pear-shaped diamond for $1,224,500. Russians showed less interest in white diamonds in the latter half of 2008 than had been the case in the six months prior, and appear to be more focused on important colored stones as well as the great signed pieces, both period and contemporary. Buyers in the Mid- and Near East continue to seek out natural pearls and fine colored gem stones, but signed and period jewels do not appear as significant. Savvy U.S. collectors are looking at mid-20th century jewels “on trend” with current tastes for fashions from the 1950’s through the 1970’s. David Webb’s signature enameled animal bangles and textured gold jewelry have re-emerged as the “look” for a new generation of collectors, for example, a coral and diamond elephant bangle bracelet by Webb brought $95,500. Cartier, Van Cleef & Arpels, Chanel, Verdura, and Schlumberger pieces are as popular as ever; and their prices have as much to do with the beauty of the designs as does the “provenance” or the stories connected with them. In any instance, “rarity” is the driving force, whether it pertains to diamonds, colored stones or jewels by famous makers, and buyers around the world are willing to pay a premium for it. Signed Buccellati pearl and rose-cut diamond leaf design choker and matching drop earrings from the estate of Gladys Bendetsen auctioned by Sloans & Kenyon for $47,200 on Sept. 17, 2006. Long before the nation’s capital became the world’s richest metropolitan area (yes, New York, Dallas and L.A., it’s true), well-heeled Washingtonians were known for their magnificent jewelry. Recall that legendary gold-mine heiress Evalyn Walsh McLean draped her neck, and occasionally that of her Great Dane, with the Hope Diamond! All through the Edwardian era and fabulous flapper fêtes of the 1920’s, and then the “Days of Camelot” and lavish entertaining of the Reagan era, stunning jewelry was – and remains – de rigueur at embassy soirées, inaugural balls and black-tie charity galas. A stunning array of jewelry is available right here in Washington, some of which comes with bragging rights and even a touch of scandal. Jewelry from the estates of local luminaries has been auctioned over the years, including pieces once worn by Gladys Bendetsen (named one of Washington’s most attractive women in 1951), Baroness Constantine (“Garnett”) Stackelberg, Countess Adelaide d’Eudeville, and even Barbara Bullock (who embezzled teachers’ union funds to outfit herself in style). Local residents have always favored beautiful baubles, especially at beautifully affordable prices. Bling from the finest makers, including Buccellati, Tiffany & Co., Cartier, and Van Cleef & Arpels, stars on the primary as well as secondary markets, supported by choice necklaces, bracelets, ear clips and rings by designers of only slightly less renown. Estate jewelry from the Victorian and Art Deco eras through the 1970’s is bountiful and obtainable at Washington auctions. A $5,000 bidding budget can secure a necklace resplendent with 88 diamonds, a pair of 19th-century gemstone encrusted platinum clips, or even a gentleman’s gold Cartier “panther head” ring. For $10,000 to $20,000, auction buyers might capture a carved 104-carat cabochon emerald brooch or a diamond floral “tremblant” pin sporting 123 brilliants. It’s possible to build a collection of splendid pieces, each with its own story, right here in Washington – now more than ever a city of fashion and great taste, enhanced by the sparkle of beautiful and sophisticated jewelry. Alexander Calder hammered silver fringe necklace, 1940. Sold at Doyle on Dec. 12, 2008 for $170,500 from the estate of William B.F. Drew. We have found the auction market for jewelry in New York to be surprisingly resilient, even in times of economic uncertainty. Currently, global buyers are looking to jewelry, especially fine diamonds and signed pieces, as a tangible asset whose value has been proven to stay intact five, ten or 20 years hence. In this respect, jewelry is an antidote to the smoke-and-mirrors game many financial institutions are playing with their clients’ assets. Intelligent buyers are also drawn to jewelry because they can truly understand the source of its value. They have done their research. They want the highest quality pieces by makers that will always reflect luxury: Cartier, Van Cleef & Arpels, Tiffany & Co., and so on. When buying important jewelry directly at auction, as many individuals are starting to do, it is important to keep these factors in mind. If you do your homework, jewelry can be a integral part of diversifying your portfolio. Doyle New York’s successful sale of Important Estate Jewelry on December 10 showed an unusually high percentage of top lots selling to private collectors, where formerly the majority of buyers had been dealers. Even as the art market softens, certain pieces of jewelry are positively influenced by cross-market appeal to the art world. In this sale, we had two pieces of hammered silver jewelry by Alexander Calder. Both far exceeded the high range of their estimates, reflecting the overall strength of the jewelry market and the resurgence of interest in this area of the artist’s work. The late Doris Duke wears pieces auctioned at the $12 million Christie’s sale of jewels from her estate in June, 2004. Great collections run throughout the ages and while they always contain a great gem or two – an important diamond, a beautiful sapphire or ruby or emerald – one usually sees a range of jewels and accessories from the Deco years. Among them might be signed bracelets, necklaces, and ear clips by the likes of Boucheron, Bulgari, Cartier and Van Cleef & Arpels plus simple, stylish pieces including gold chains, minaudières, lipstick holders, evening bags, and in some cases beautifully gem-set swizzle sticks for champagne flutes. While the 1920s were a great period for jewelry manufacturing, the ’60s and ’70s were also notable for bold creations, especially by jewelers such as Harry Winston, an avid buyer and seller with a clientele that included royal and noble families and other prominent collectors throughout the world. A great jewel, however, does not always need to be associated with a famous maker (although it does add extra pizzazz). Its crafting will always tell you that it was created in a great workshop. History and provenance are also important, a fact proven by the high prices achieved at auction for famous collections over the years. If you peruse past catalogues displaying photos of jewels once owned by Florence Gould, Vera Hue-Williams, Princess Salimah Aga Khan, Doris Duke, Princess Margaret, Ellen Barkin, and only recently Christina Onassis, one can’t help feeling transported by their taste and style and the interesting lives they led. Such personal connections impact prices tremendously. 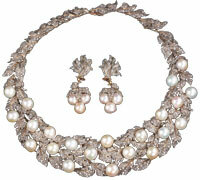 For example, consider a single strand natural pearl necklace that sold at Christie’s Geneva in 1999. On its own, it might have achieved $200,000-$300,000, but since it had been previously owned by both Queen Marie-Antoinette and Woolworth heiress Barbara Hutton, the price skyrocketed to $1.5 million. Just last year in New York the Royal Baroda Pearls achieved a sensational $7.1 million. Naturally the pearls were very rare in their size and quality, but the provenance most definitely made all the difference in the price.